Hello Fall! Too soon? Crazy Monkey is closing the summer out with a bang and turning its sight to the cool fall months. This is a busy time for everyone and with of tons of things to celebrate and all the holidays, we will be booked up quick! Have you considering renting a dry slide in Erie? Our inflatable dry slide rentals are very popular drying the colder months since they can be easily set up indoors and don’t require water to be slippery. Our happy customers report that the dry slides are just as much fun as the water slides! 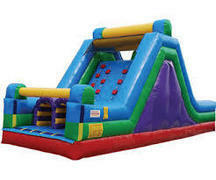 Click here to check out dry slide rentals. Crazy Monkey also has a dry slide and rock climb combo that is great for the cooler weather months as well. This one works great set up in gyms! Concessions are always a hit at the fall parties! There’s just something about popcorn that reminds us of fall and Halloween. Check out our popcorn machine here. Thanks for choosing Crazy Monkey for renting a dry slide in Erie! You won’t be disappointed, click here to contact us today with questions or to reserve your fall rentals.